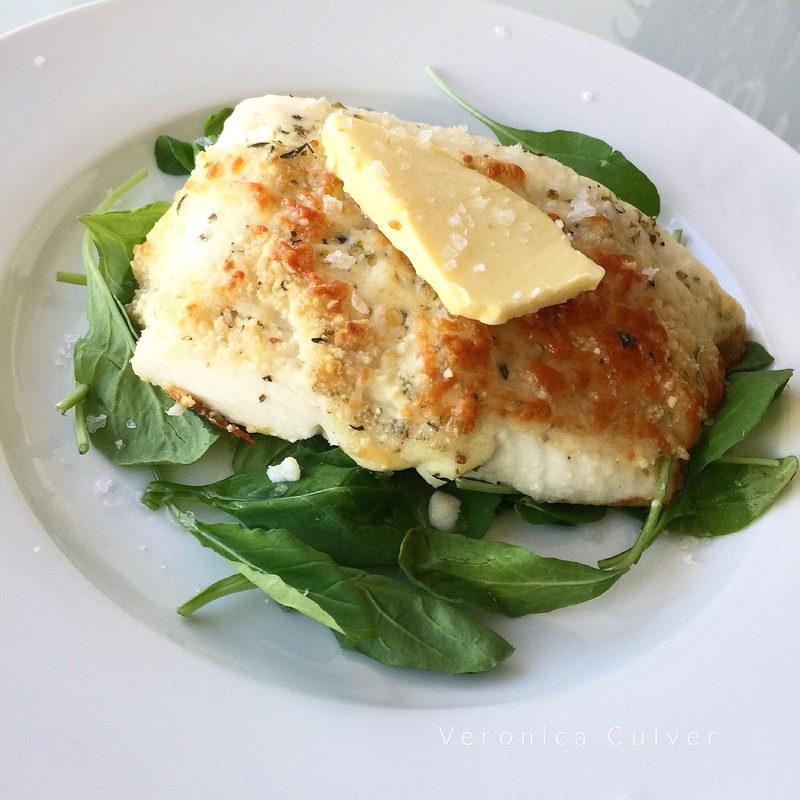 This Parmesan Crusted Halibut is not only amazingly delicious and good for you, but it's also easy to make and cooks in about 15-20 minutes! Wild-caught halibut is a mild-tasting lean fish with lots of protein, zero carbs and it's a good source for heart-healthy Omega 3 fatty acids. It's the perfect vessel for this rich and flavorful preparation. This dish is Paleo if you tolerate cheese and if you don't, I've got a modification for you below. Bonus - the modification also makes it Bulletproof Diet friendly. Butter a large baking dish with 1 Tablespoon of the butter. Lay the 4 pieces of halibut evenly spaced across the bottom of the dish. Sprinkle each filet with a light dusting of Himalayan pink salt or sea salt. Sprinkle half of the dried Italian seasoning evenly across each filet, reserve the other half. Spread the mayo evenly across each filet. Sprinkle each filet with 1 teaspoon of the almond meal or almond flour. If omitting the cheese, sprinkle each filet evenly with the remaining dried Italian seasoning. Otherwise, continue by evenly coating each filet with the Parmigiano Reggiano and Asiago cheeses, then top with remaining dried Italian seasoning. Place the dish in the oven uncovered and cook for approximately 15-20 minutes or until the fish is opaque white in the middle and the top is lightly browned. If using cheese, you may wish to place under the broiler for about 1 minute to get a nice crispy crust. Remove from oven and serve with a pat of grass-fed butter atop each (optional). Serving Suggestion: I like to plate my fish atop a bed of greens (like the baby arugula pictured) and drizzle everything with a little Bulletproof Brain Octane (or you can use MCT Oil or unflavored coconut oil) and additional sea salt. The heat from the fish lightly wilts the greens and the addition of healthy oils are satiating and good for keeping my brain and body fit and performing optimally.